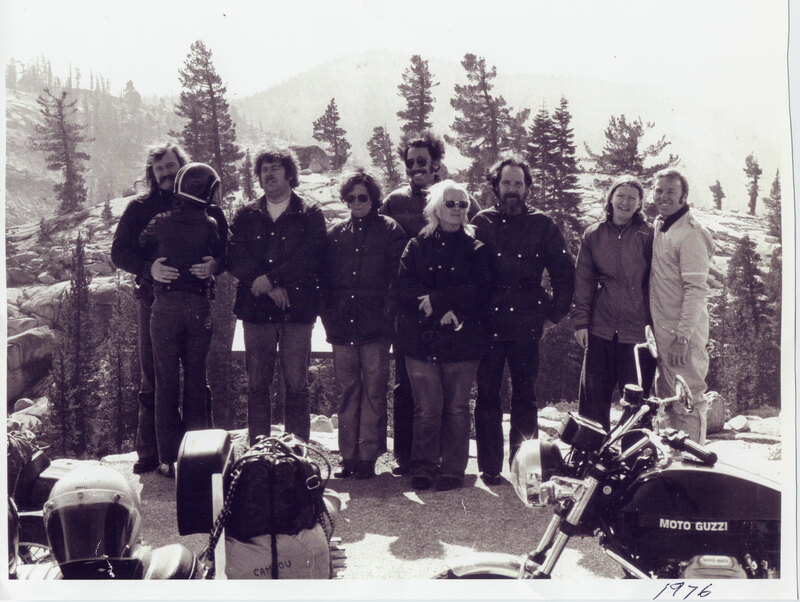 The San Francisco Northstars Motorcycle Club was started in 1974 by a group of S.F. motorcycle police officers who took their riding, guns, eating, & drinking very seriously. Biweekly meetings & dinner with 1-2 street rides per month was the norm. Additional DP, dirt, & camping rides were scattered throughout the year. An Annual Picnic and Annual Club Dinner with an Awards Gala along with Special meetings at local breweries with connections inside the Northstars were also part of the yearly schedule. Today, the Northstars are made up of people from all walks of life who share the main priority of riding and eating (especially dessert!) along with some of the passions of old and a general taste for travel and adventure. 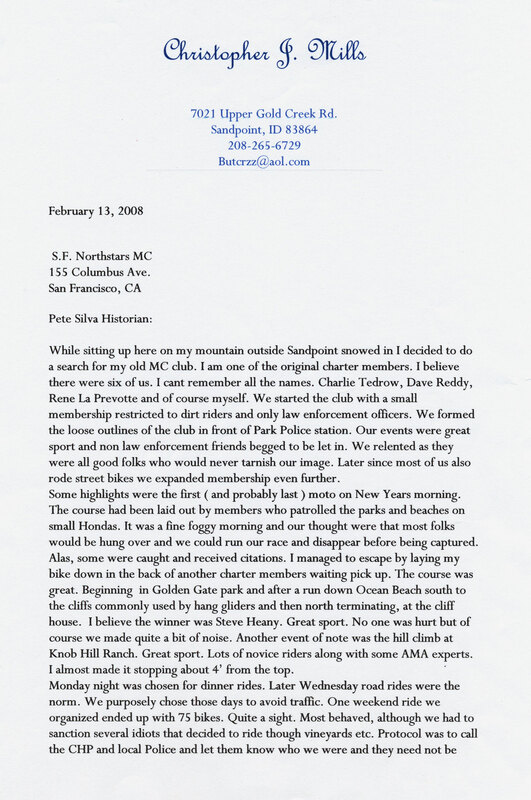 We are based in San Francisco but the membership consists of people from all over the Bay Area and beyond including some connections to the riders of the Pacific Northwest (also known as WetLeather). Spring Song Dog Ranch Rides. Pismo Dunes & Beach Party, & More Pismo pictures! 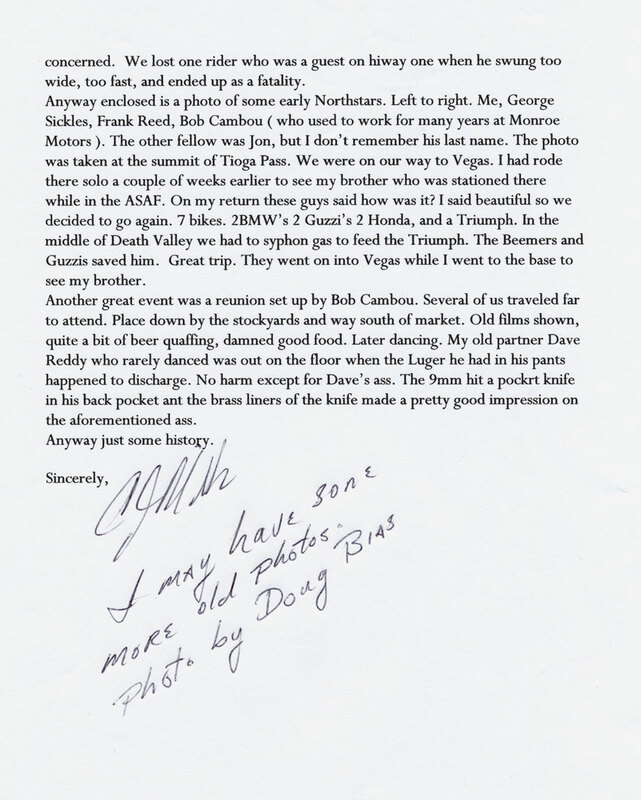 At the October, 2008 meeting, we received a letter (page 1, page 2) from C.J. Mills with a photo from a Las Vegas Ride through the Sierras. "We Ride to Eat, & Eat to Ride!"